Register Log In GliderCENTRAL Forums HELP! I'M NEW... Pets similar to sugar gliders? I recently moved to California and used to have gliders back home. I miss them tremendously, but of course loved them enough to find a loving home for them before moving here. They were by far and away the best pets I've ever had!! I'm wondering if there's any small-ish pets out there that compare at least somewhat to sugar gliders? 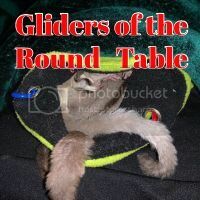 If you have any inputs please post here as I would love to get inspiration for legal yet as similar as possible pets to gliders. I have experience with dogs, cats, guinea pigs, hamster of various kinds, turtles, bunnies, gerbils, chipmunks and of course sugar gliders. My gliders were all super tame and bonded to me and my little Alba used to always wake up before the others, stick her head out and deliberately wait for me to come and pick her up so she could sleep all curled up in my hands until the others would wake up. Man, those little fluffies just gets to your heart. California has banned just about everything except Dogs and Cats. Your best bet would be to get in touch with someone in the government that would start a bill to legalize sugar gliders, ferrets, and other animals that are banned. I have a lot of experience was many types of exotics and I must, sadly, report that I've never raised a critter that I would equate to a sugar glider. They are such a unique blend of ease, cuteness, personality, with the added bond they form with their colony and owner/slave. I agree with Feather/Kimberly, try to work with lawmakers to correct the laws to allow non-harmful exotics. If you register so you may access other parts of these forums, there are people who lurk here that have some experience with that process. Gliders were once illegal in Massachusetts and Georgia, they changed their laws and they are now legal there. I haven't done anything on the state level, but I have worked with three different cities on their exotics ordinance. The big one was the city of Madison as they already had a ordinance in effect. That ordinance was used by other cities and that is where I stepped in and got them to exempt sugar gliders just as they did ferrets. The ordinance read "No Mustelidae (except Ferrets)" so now their ordinance reads "No Marsupials (except sugar gliders)" and I successfully got the city of Madison to change their No Marsupial policy to read "No Marsupials (except sugar gliders)"
Exotic lizards is about all that's left in CA. You can however get a USDA licence to have gliders, hedgehogs and ferrets but you have to prove they are display animals for educational purposes similar to a zoo environment. Not sure what those requirements are though. Could be as simple as taking them to a school for show and tell but I doubt it. CA has big government and a lot of red tape. I mean certain cities dont even allow straws in restaurants and the grocery bag tax that you pay goes to some private company in Texas. Try getting around that corruption. Last edited by Luckey; 03/26/19 04:24 AM. California politicians don't care about pets. The second one person says anything about the ecosystem (with basis or not) the politician will fold.